The Tamil Nadu Chief Minister on Tuesday directed authorities to immediately file a contempt petition against the Karnataka government for flouting the verdict of the Supreme Court by unilaterally stopping the release of Cauvery water to Tamil Nadu. 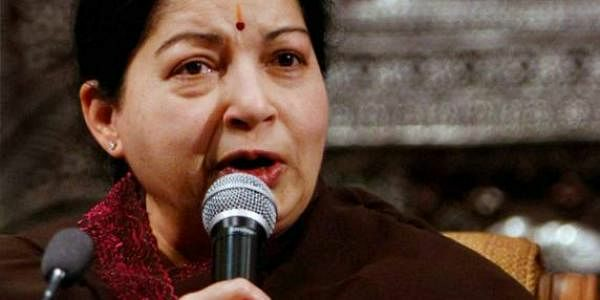 Chief Minister J Jayalalithaa on Tuesday directed authorities to immediately file a contempt petition against the Karnataka government for flouting the verdict of the Supreme Court by unilaterally stopping the release of Cauvery water to Tamil Nadu. “Karnataka government’s decision to stop the release of water to Tamil Nadu went against the federal principle of India as well as insulting the verdict of the apex court,” an official release here said and added that the contempt petition would be filed against Karnataka to get the due share of Cauvery water. A decision to this effect was made at a meeting, chaired by the Chief Minister, in which PWD Minister K V Ramalingam, Chief Secretary Debendranath Sarangi and PWD Secretary M Saikumar participated. Following the efforts of Jayalalithaa, the Supreme Court had on September 28 directed Karnataka to honour the order of PM Manmohan Singh, who is also the Chairman of the Cauvery River Authority, asking Karnataka to release 9,000 cusecs of water to Tamil Nadu daily till October 15. Karnataka, which started releasing water as per the SC orders, unilaterally stopped it on Monday. During the September 19 CRA meet, the PM had directed Karnataka to release 9,000 cusecs to TN between September 20 and October 15.